The series is connected to the world renowned Star Trek franchisee and the events of this series take place in a time span ten years earlier than that depicted in the Star trek movies. Where can you stream Star Trek: Discovery? On 2017-09-24 Sci-Fi & Fantasy TV Series Star Trek: Discovery first aired on CBS All Access. 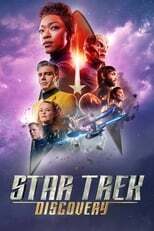 Written and created by Bryan Fuller & Alex Kurtzman, and produced by Secret Hideout & Paramount Television, Star Trek: Discovery will return and was last broadcasted on 2019-04-18.